SKYSCRAPERS aren’t the only thing sky-high in Hong Kong. Rents for high-end flats are the most expensive in the world, at nearly $12,000 a month. ECA International, a human-resources consultancy, compiled the ranking. 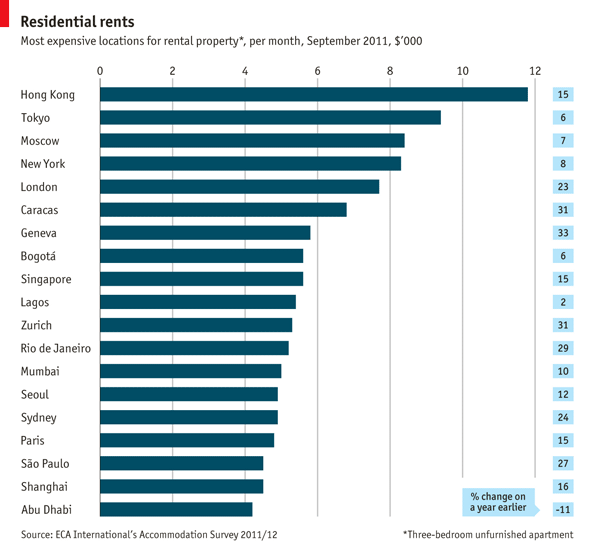 Geneva and São Paulo both climbed six places up the table from their positions last year, as rents shot up around 30% in 12 months. But Abu Dhabi, the only city in our chart where rents fell, dropped nine places as its three-year housing slump continued.